The president called Stormy Daniels "horseface" on Twitter. President Donald Trump's calling adult film star Stormy Daniels "horseface" is just the latest instance of his publicly insulting women's looks or intelligence. Trump is known for giving many of his opponents negative nicknames, men as well as women, but his use of this tactic with women often denigrates their appearance or abilities. He has called MSNBC personality Mika Brzezinski "crazy," said that Rep. Maxine Waters, D-Calif., has a "low-I.Q.," and said of Carly Fiorina, his only female rival for the GOP presidential nomination in 2016, "Look at that face! Would anyone vote for that?" Here is a rundown of some of his attacks. Trump on Tuesday hurled the "horseface" comment against Stormy Daniels the adult film actress who alleges she had an affair with him years before he took office and that she was paid off to keep silent. Trump denies having a sexual relationship with her and has said that he did not know of a payment she received from his former personal attorney Michael Cohen. After a judge on Monday dismissed a defamation suit by Daniels against Trump, the president tweeted about the decision, saying, "Great, now I can go after Horseface and her 3rd rate lawyer." Trump has lobbed similar insults at all kinds of people -- especially those who attack him -- as the White House pointed out in his defense, but certain pejoratives take on a deeper meaning when hurled at African-Americans, some experts say. University of Southern California professor Ange-Marie Hancock Alfaro, whose expertise includes political engagement and African-American politics, said Trump's word selection, when applied to people of color like Manigault Newman and Waters, plays into the historic and “ongoing narratives that we have in this country that are associated with African-Americans” that they are “less intelligent than white Americans." Trump made insulting comments about MSNBC personalities Mika Brzezinski and Joe Scarborough on Twitter in June 2017, calling Brzezinski "crazy" and claiming she was "bleeding badly from a face-lift" a few months ago. That slam was not his first attack on Brzezinski. In August 2016 he called her "off the wall, a neurotic and not very bright mess," "very insecure" and "crazy" in three tweets spanning five days. The next month, Trump wrote "crazy and very dumb @morningmika had a mental breakdown while talking about me" on MSNBC's "Morning Joe." (Paul Zimmerman/WireImage/Getty Images) Television hosts Joe Scarborough and Mika Brzezinski attend "The Americans" Season 5 Premiere at DGA Theater on Feb. 25, 2017 in New York. In his tweets, Trump said that she had had a face-lift and tried to spend time with him at his Mar-a-Lago estate, writing in two tweets, "I heard poorly rated @Morning_Joe speaks badly of me (don't watch anymore). Then how come low I.Q. Crazy Mika, along with Psycho Joe, came.....to Mar-a-Lago 3 nights in a row around New Year's Eve, and insisted on joining me. She was bleeding badly from a face-lift. I said no!" White House spokeswoman Sarah Huckabee Sanders defended Trump's tweets on Fox News, saying he has been subject to "outrageous" personal attacks on "Morning Joe." "This is a president who fights fire with fire and certainly will not be allowed to be bullied by the liberal media and the liberal elites within the media or in Hollywood or anywhere else," Sanders said. During a broadcast immediately preceding the face-lift tweet, Brzezinski, referring to a Washington Post article that said Trump displayed a fake Time magazine cover of himself in some of his golf clubs, brought up the size of Trump's hands, a sore point for him. After his tweets that morning, she shared a photo of a Cheerios box on her Twitter page. The back of the box reads, "Made for little hands." 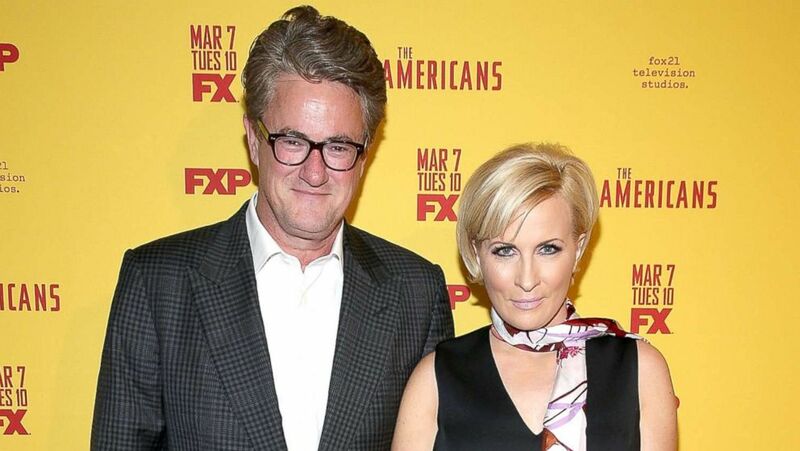 Despite the vitriol that Trump has directed toward the "Morning Joe" hosts, he has been friendly with the two for years. They told Vanity Fair that they met with him at the White House a week after his inauguration. At the meeting, they said, Trump suggested they get married at Mar-a-Lago and offered to officiate. The communications team for MSNBC, the cable network that airs "Morning Joe," wrote on Twitter, "It's a sad day for America when the president spends his time bullying, lying and spewing petty personal attacks instead of doing his job." Brzezinski isn't the only on-air personality to become one of Trump's targets. During the campaign, he had a turbulent relationship with then–Fox News anchor Megyn Kelly, whom he also called "crazy" in eight tweets in March 2016. Their sparring reached a very public level after she asked him what he perceived as an unfair question during one of the GOP primary debates. Afterward, he insulted Kelly in an interview with CNN, saying, "There was blood coming out of her eyes, blood coming out of her wherever." He later said in an interview with ABC's "This Week" that by "wherever," he meant her nose. (Paul Sancya/AP) Moderator Megyn Kelly takes the stage during a Republican presidential primary debate at Fox Theatre, March 3, 2016, in Detroit. At campaign rallies, Trump was known to single out NBC News reporter Katy Tur, sometimes calling her "little Katy" in front of crowds and writing on Twitter that she is a "3rd rate reporter." He doesn't save his "crazy" label for broadcast journalists. In September 2016, he posted a tweet calling New York Times columnist Maureen Dowd "crazy." There are a host of other times Trump publicly criticized women's appearance, both before and during his presidential campaign. Before he entered politics, he rated women's appearance on Howard Stern's radio show from 1997 to 2008. During the campaign, he appeared to insult then-competitor Carly Fiorina, saying in an interview with Rolling Stone, "Look at that face! Would anyone vote for that? Can you imagine that, the face of our next president?!" Trump later claimed he was talking about her persona and not her appearance, but Fiorina made it clear at the next debate that she wasn't buying it, saying flatly, "Women all over this country heard very clearly what Mr. Trump said." Also during the presidential campaign, Trump retweeted a post that had side by side a photo of his wife, Melania Trump, and an unflattering photo of Heidi Cruz, the wife of his then-competitor Sen. Ted Cruz, R-Texas. The photo was captioned, "The images are worth a thousand words." Asked about the retweet by CNN's Anderson Cooper during a town hall event in Wisconsin, Trump responded, "I thought it was a nice picture of Heidi. I thought it was fine." When pressed, Trump said that Heidi Cruz is "a pretty woman."